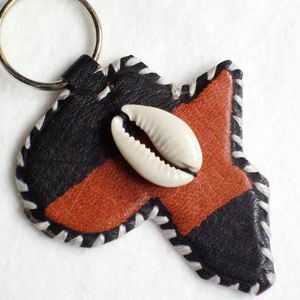 A painted leather keyring in the shape of Africa adorned with a cowrie shell. Height approx. 7 cm (measured without the ring). Width approx. 6 cm. All key rings are handmade, are therefore unique and can vary in size, appearance, colour and shape.